polka & bloom: Embellish with Stitches - new class! 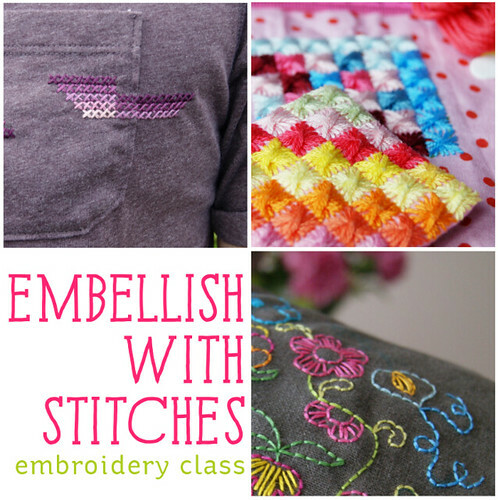 Embellish with Stitches - new class! If you're anything remotely like me you've probably got a few pieces in your wardrobe that could be worn a bit more frequently. Yes? That jacket you used to love but now the love has faded slightly. Or a tshirt that could do with a brightening up. Well, that's what my new class is all about! It's four weeks of stitchy goodness all focused on giving our wardrobes a bit of a makeover. There will be some fun techniques, new stitches to try and classics like cross stitch. All in delicious happy colours of course! The class is suitable for anyone, beginners and more experiences stitchers. The class starts on May 20th and runs for 4 weeks. You will have access to the class site after the end of the class and most of the material will also be available as PDFs to download and save on your computer. Sign up here for the class.